Do I really need to be an entrepreneur? Do I need my own business? 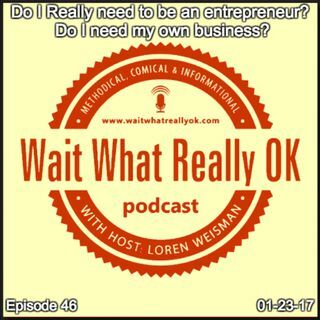 Wait What Really OK Podcast Episode 46 hosted by Brand Precision Marketing Strategist and Counselor, Loren Weisman asks a simple question. Do I really need to be an entrepreneur? In a day where it seems if you are not trying to be the biggest and best thing ever, then you are nothing. And this is flat out sad. Way too many people are making up hype they can’t back up to claim they are doing things they ... Más informaciones haven’t and know how to do things they can’t do. All while presenting a false success that they have never achieved, which somehow they can magically show everyone else how to do. The muddying of the business waters with all these serial entrepreneurs, experts, consultants, coaches, guides, gurus and what ever else is the flavor of the month term has gotten out of hand. With certified courses to teach you how to teach things you haven’t learned, it makes it even worse. Do I really need to be an entrepreneur? Do I need my own business? WWROK Ep46 of the Wait What Really OK Podcast is available on iHeartRadio or on Spreaker. Hosted by Brand Precision Marketing Strategist and Counselor, Loren Weisman, Wait What Really OK is A Methodical, Comical and Informational Podcast covering the best approaches for business and the arts today. Copyright 2016 eMbloh Music (ASCAP)/ Cienzo Music (BMI). Copyright 2016 Dig And Be Dug Music (BMI). Podcast Blog Supplement for Episode 46 of the Wait What Really OK Podcast with Loren Weisman. Podcast Link Supplement for Episode 46 of the Wait What Really OK Podcast with Loren Weisman. Why should you claim to know more than you do if you cant deliver? Podcast Video Supplement for Episode 46 of the Wait What Really OK Podcast with Loren Weisman. Podcast Photo Supplement for Episode 46 of the Wait What Really OK Podcast with Loren Weisman.